About two years ago Mark and I got married up in the North Carolina mountains. We stayed in a beautiful cabin on lake glenville with our families and dog + a banjo band. We took canoes out on the lake, went walking in the woods and cooked a bunch of food. It was casual but memorable and I wish I could do it all over again. 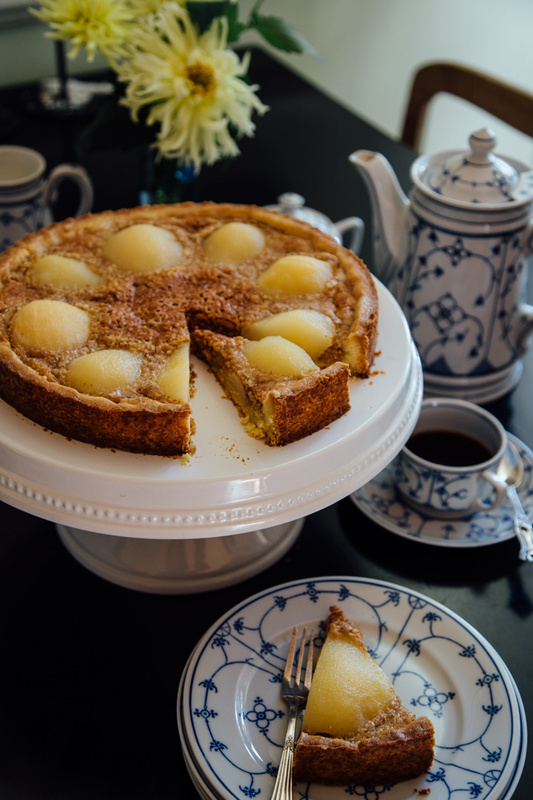 My mom made delicious desserts – this buttery pear tart was one of them. 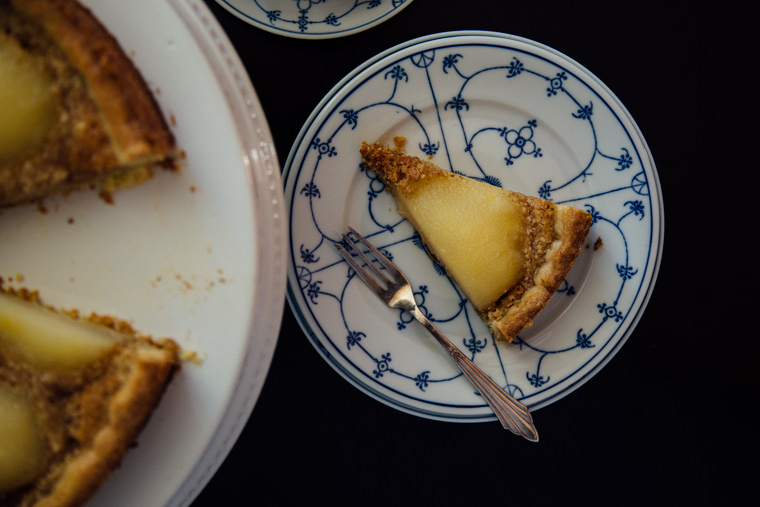 We’ve been celebrating special occasions with this tart for years and it’s about time I learn how to make it! Since I’m not much of baker the step-by-step pictures help me out a lot – they almost make it seem easy which is crazy for how deliciously lovely and authentically French it tastes. Process the ingredients for the crust in your kitchen aid with blade until you see the dough begin to come together – this will take at least 5 minutes or so. Divide dough into 2 balls (2/3rd and 1/3rd) roll out 2/3rds of dough on floured surface to the size of the springform with the remaining 1/3rd dough, shape a crust an inch high. 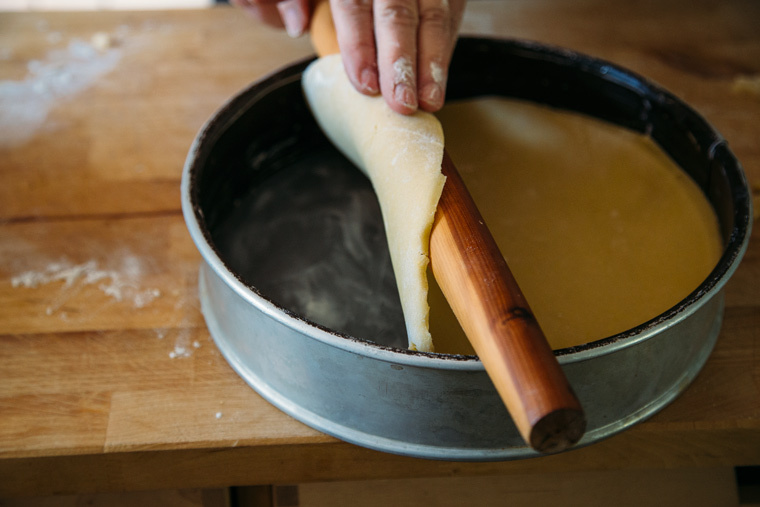 A tip for getting the dough into your spring form pan: Roll it around the rolling pin and drop it in! 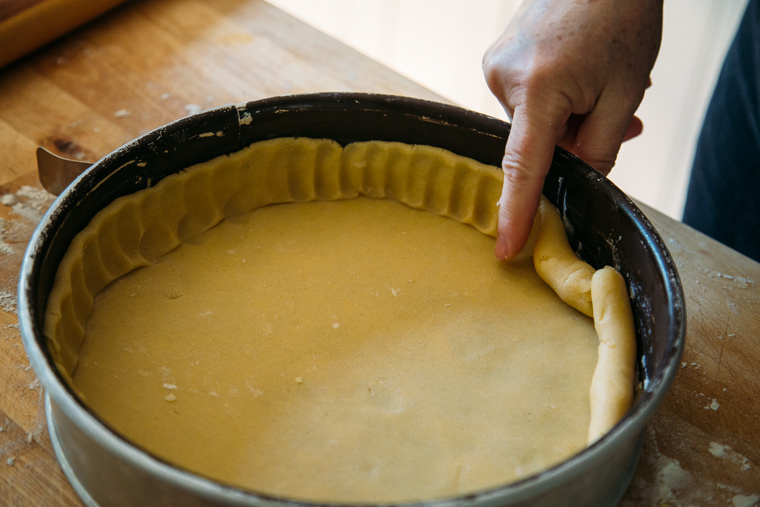 Pinch the sides of the crust with your fingers. 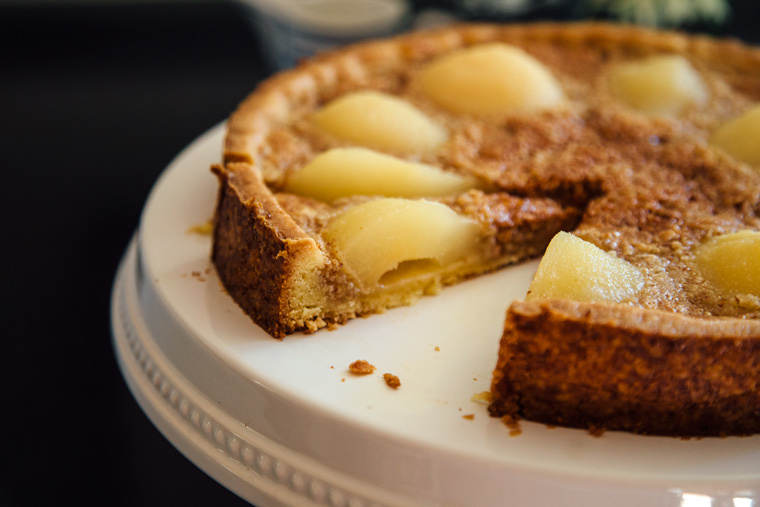 For the Frangipane, melt the butter in a saucepan add the sugar and stir to bring to a boil. Remove from heat. 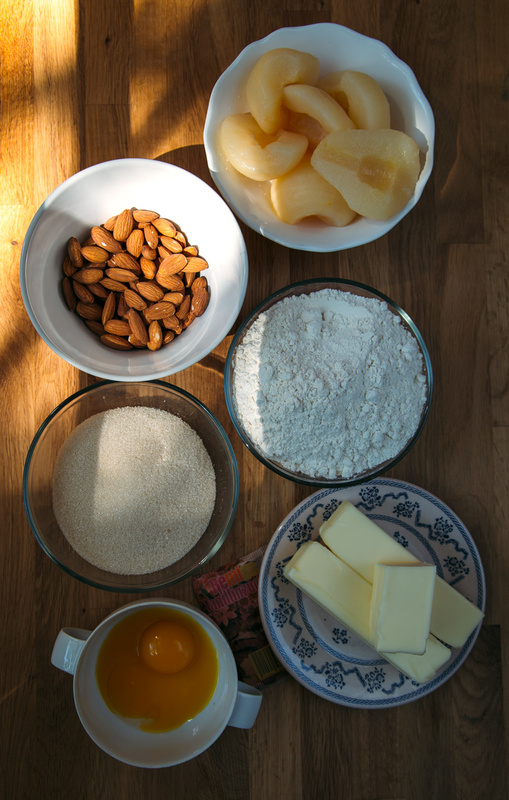 Add the ground almonds and the egg yolk. 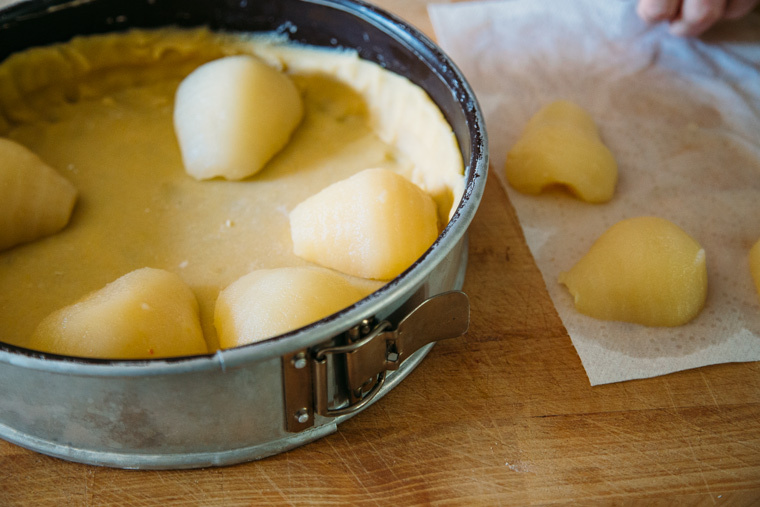 Arrange the pear halves (dried thoroughly first) on the pastry dough. 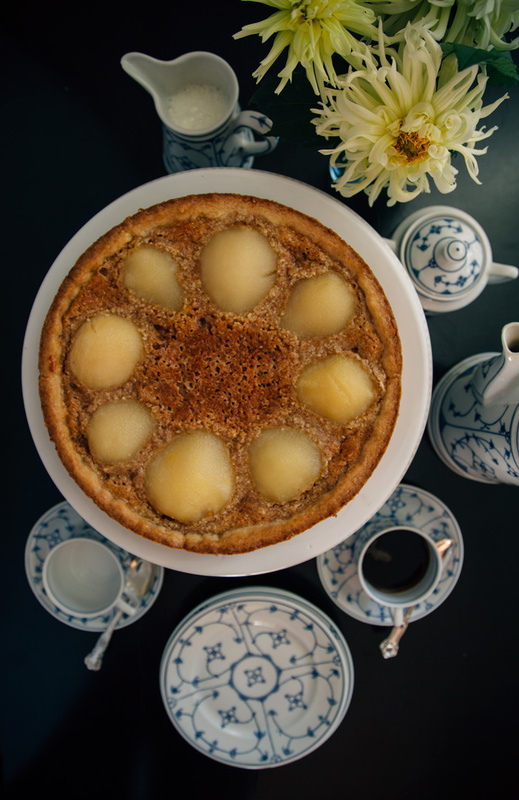 Pour the frangipane between the pears. Bake at 350F in a preheated oven for 40 minutes on the rack a notch below the center rack. After it’s done baking and while the tart is still hot glaze the pears with the reduced syrup. 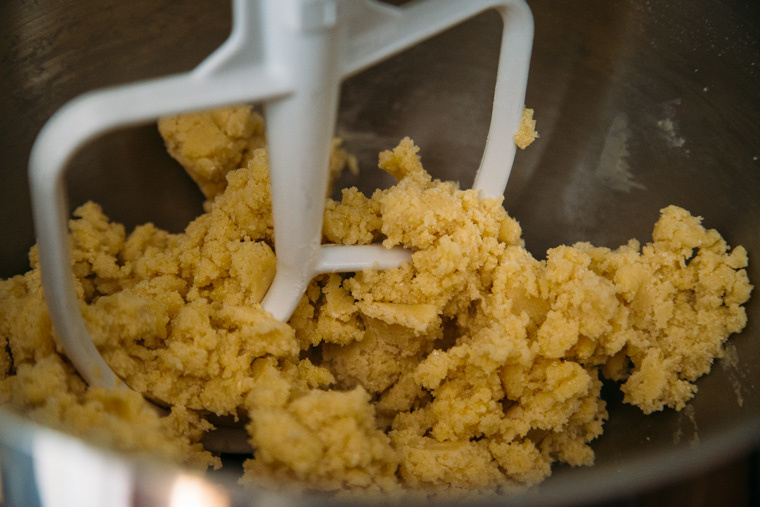 Process the ingredients for the crust in your kitchen aid with blade until you see the dough begin to come together – this will take at least 5 minutes or so. 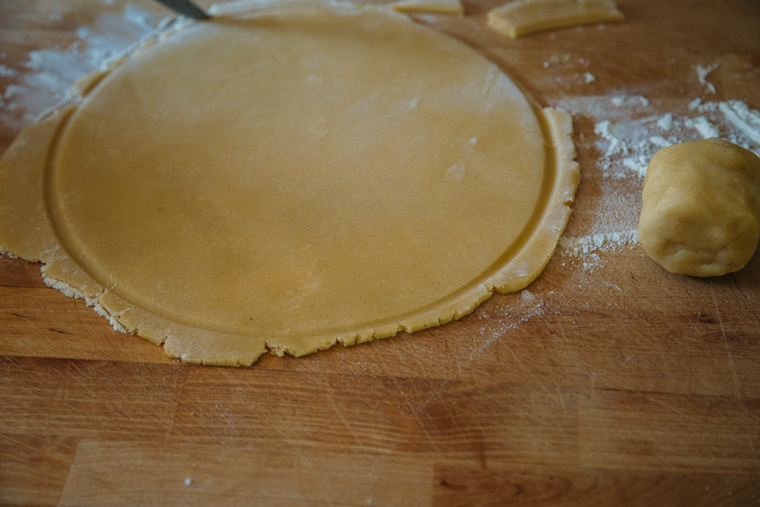 After it begins sticking to the blade, shape the dough into a ball with your hands. Divide dough into 2 balls (2/3rd and 1/3rd) roll out 2/3rds of dough on floured surface to the size of the springform with the remaining 1/3rd dough, shape a crust an inch high. 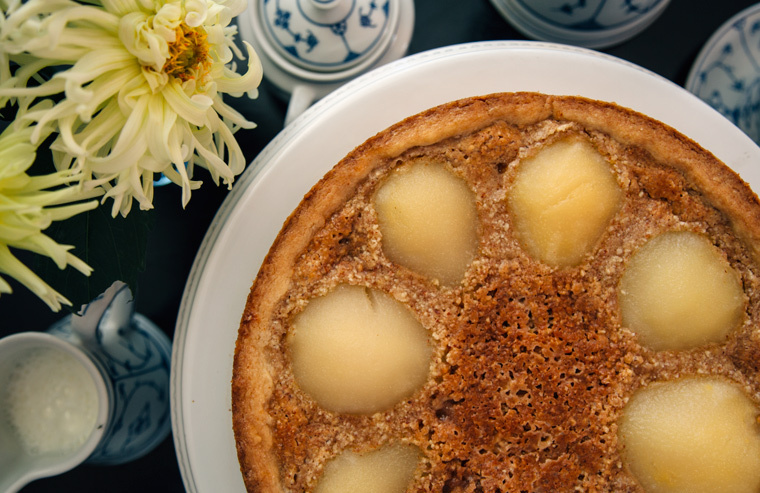 Chill while you make the frangipane. 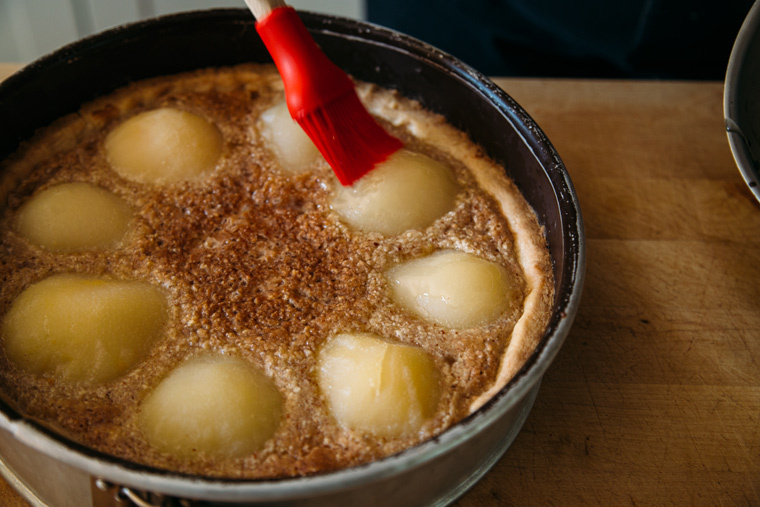 For the Frangipane, melt the butter in a saucepan add the sugar and stir to bring to a boil. Remove from heat. 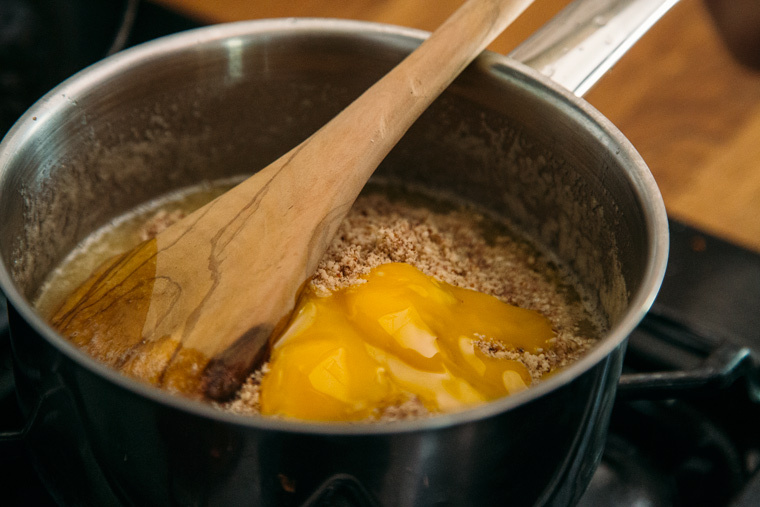 Add the ground almonds and the egg yolk. 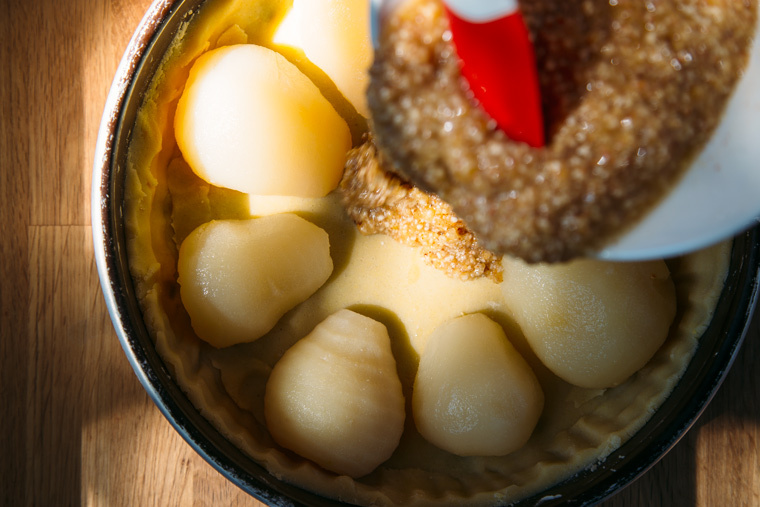 Arrange the pear halves (dried thoroughly first) on the pastry dough and pour the frangipane between the pears. Bake at 350F in a preheated oven for 40 minutes on the rack a notch below the center rack. 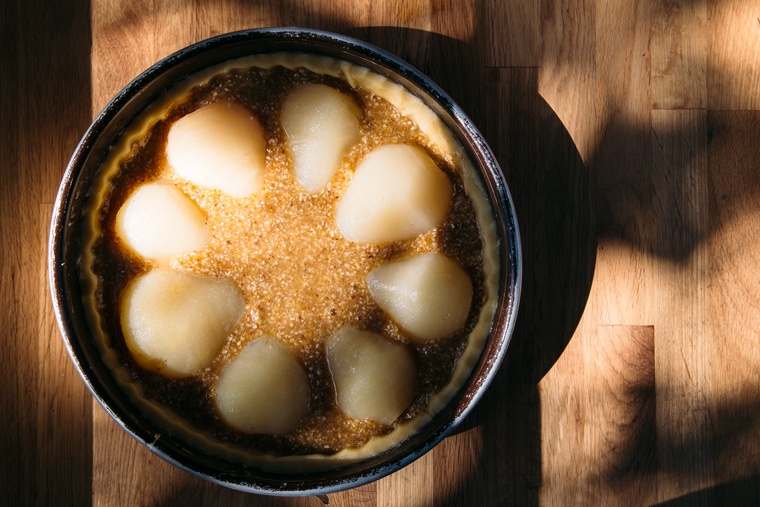 After it’s done baking and while the tart is still hot glaze the pears with the reduced syrup. Reduced syrup can be made with the juice from the jarred pears. 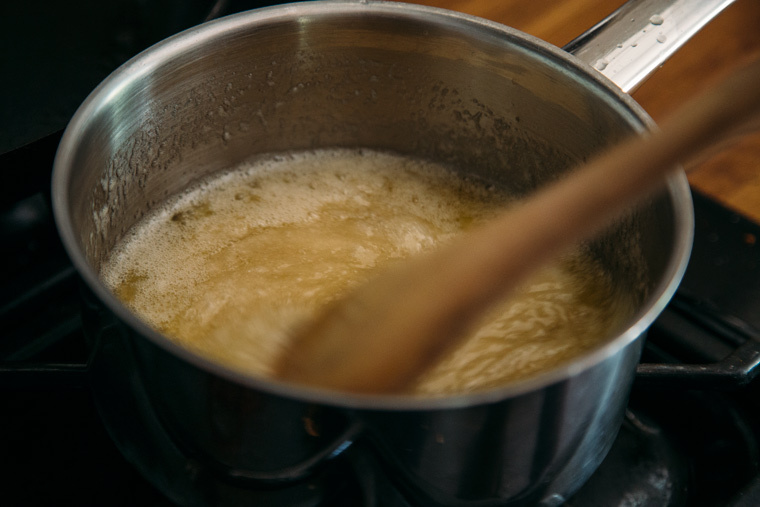 Just bring 1/4 cup of juice to a boil and let simmer until it’s syrupy and reduced. Optionally, you can brush the pears with orange marmalade – just enough to give them a glisten. Cool in spring form about 20 minutes and transfer to platter. Such a stunning dessert. This is lovely! I have had the combination of these tiny sugar pears I found at the market and frangipane dancing in my head for the last few days, and here you’ve read my mind Such a beautiful combination. Seeing yours makes me want to get into the kitchen and begin baking! Thank you Olivia! You are totally a baker – those cashew butter cookies on your blog look fantastic! Yay Emily! YES YOU CAN! Buttload pear party this weekend! Hi Grace, love that you kept the pears whole here, very nice!